From £ 15,617 excluding VAT & fees ? Price includes Citroën customer discount and Government Plug In Grant. Price excludes VAT, delivery to Dealer, number plates and first registration fee. Citroën Berlingo Electric is amazingly affordable to run, with average energy costs of just 2-3p per mile, that’s less than 2 pounds per 40 miles. This feat of technology has been achieved without compromising on performance as Citroën Berlingo Electric accelerates nicely, reaching 68 mph and has a maximum operating range of 106 miles*. The battery is included in the price of the vehicle - so, there no hidden additional charges, and maintenance costs are lower than petrol or diesel vehicles, as there are far less mechanical working parts. Additionally, drivers can benefit from London congestion charge exemption alongside opportunities for free parking, charging and bus lane access, so Citroën Berlingo Electric is both practical and cost-effective. *NEDC test figure. In real world use, range is impacted by numerous factors and is likely to be lower. Citroën Berlingo Electric can be recharged in so many locations, even at home! Benefiting from two separate charge ports as standard, the AC ‘standard’ charge port provides a 100% charge in 8 hours from a Type 2 socket, or in 10 hours through a standard domestic plug socket*. Alternatively, there’s also a DC rapid charge provided as standard – charging the battery to 80% in just 30 minutes. By speaking to an expert you can ensure you adopt a charging solution that suits you. Our partners, Pod Point, are one of the UK’s leading installers, and are fully approved on the government subsidy schemes for home and workplace charging. *Type 2 charging cable provided as standard. Additional accessory cable required for domestic charging. Citroën Berlingo Electric is equipped with many features to increase your comfort and driving pleasure. Air conditioning, electric door mirrors and electric windows improve your comfort, the cabin also has plenty of storage so you can feel more relaxed as you drive. Bluetooth hands-free and a CD/MP3 player help you can stay connected. Checking your range and monitoring economy is really easy, using the consumption and charge indicators. 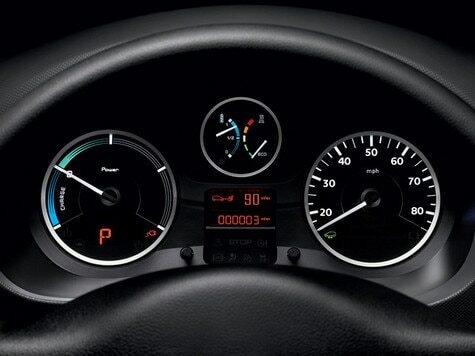 All the figures you need are clearly displayed on the dashboard and the central instrument panel. You can also check the trip computer for the same information. The optional fully glazed, insulated bulkhead is safe, snug and minimises noise in the cabin. Citroën Berlingo Electric comes in several sizes, its modularity and storage options provide a practical solution to meet your business needs. Citroën Berlingo Electric is available in 2 lengths - L1 and L2. Loading is easy, with asymmetric rear doors opening to 180◦ and nearside sliding side door as standard (twin sliding side doors on L2). With load volume from 3.3m3, load length between 1.8m and 2.05m and payload up to 636kg, Citroën Berlingo Electric is truly functional. With three full size seats, handy storage and ample space, Citroën Berlingo Electric is flexible and functional. Ranging from seat covers to exterior protection, Citroën offer a range of accessories to meet all of your business needs. The Extenso cab offers clever storage. The side seat folds flat, increasing load length to a maximum of 4.1m3, and enabling the transportation of bulky objects. The central seat folds flat, and can be used as a mobile desk thanks to its writing panel.